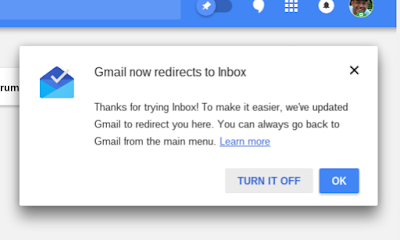 The Inbox team started rolling out on opt out feature to automatically redirect Gmail.com instances to Inbox by Gmail. Users may see a notification when visiting Inbox via the web interface that they will now have Gmail automatically redirected to Inbox. Users will have the option to opt in or out of this feature. When they click "OK" every time they go to Gmail they will end up at Inbox by Gmail. The notification will also provide the users with the ability to opt out by clicking on "TURN IT OFF"
Users will have the option to change the setting, which is good news for those that opt in and change there mind. 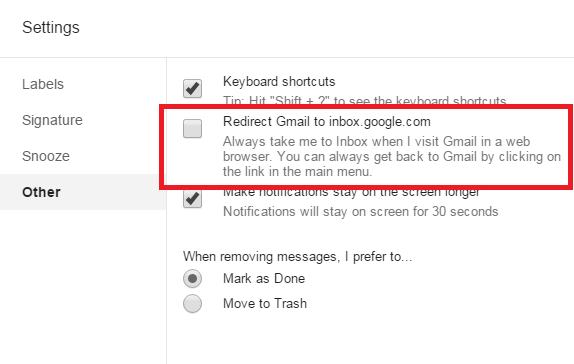 To change the setting, just go to the Settings>Other in Inbox by Gmail and change the slider next to Redirect Gmail to Inbox.